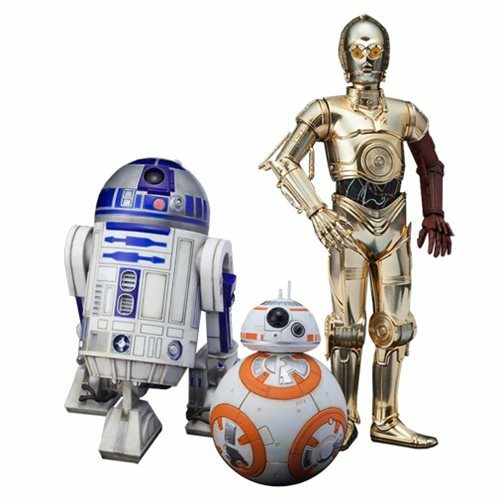 Based on their appearance in Star Wars: The Force Awakens, R2-D2, BB-8, and C-3PO join Kotobukiya's terrific lineup of 1:10 scale statues. Easily assembled with snap-fit assembly, each droid includes magnets in its feet for added stability on the included base. Crafted from plastic, the Star Wars: The Force Awakens C-3PO R2-D2 and BB-8 ArtFX+ 1:10 Scale Statue Set comes in a closed snap-bottom box. Ages 14 and up.